The band wishes to specially thank everyone from the 2011 Gouveia Art Rock Festival for their kind hospitality and thanks all those who came to see them play. Medina posted the following review under our event listing which is now archived so we have re-posted her excellent review for all of you to enjoy. Thanks again Medina! Sometimes we are lucky to have during our lives the company of great music and musicians. It’s the case for me of Caravan. Their music was present in good times carried me trough some some very hard times and I listen to them just for the pleasure of it. The Gouveia Art Rock (GAR) is very informal we meet the musicians all the time in the theatre. Still it was with great emotion that I bumped with the man himself Pye Hastings a prince. I recognized him immediately and the rest of the band like when we meet with old friends. Pye Hastings Jim Leverton and Jan Schelhaas (I saw him with Camel years back) were there with their cases waiting to enter the stage for the sound check. Geoffrey Richardson wasn’t present at that moment and I got a bit worried he wouldn’t play. Later I eavesdropped the sound check and there he was playing his viola. They have this noisy kid on the drums Mark Walker who tried to destroy the drum kit during the show. That’s how you do it great drummer. Geoffrey Richardson plays a very good guitar these days. The spoonman was a big surprise for me I didn’t know he could play the guitar so good. As for the concert well you know. We lost our heads kissed a golf girl and visited Dave Sinclair’s old house with all the great stuff in the middle. 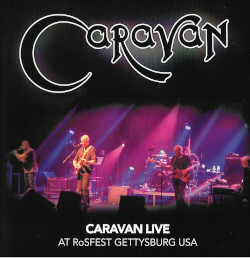 I always thought I would never see Caravan live. Pigs flew. In the words of the ABBA song (that you recently surpassed in popularity): Thank you for the music. You have no idea what it meant to me to finally got to see you in the flesh. Wished you were here. Get in your pyjamas soon! This entry was posted in Reviews on May 2, 2011 by caravan. And thank you for your comments on the drums it’s many years since I’ve been called a “kid” – excellent!